It is clear that certain electrical phenomenon appear to be self-organizing. Bill Tiller showed that focused human attention caused charge fields to compress/organize (“Conscious Acts of Creation”). In phase conjugate optics- negentropy / self-organization is well documented. Most scientists would probably agree that life is self organizing. We think we can make the case that gravity is negentropic. Lovelock – provided extensive evidence that GAIA – Earth’s major life variables- are self organizing. Here we make the case also that conventional science notion that the whole universe is moving toward entropy / disorder- may be not just a mistake but a fatal pessimism that blinds us to seeing what may be the ONLY path out of chaos. As we shall evidence here: this is true of the EEG which cause peak attention (charge self organization), and the harmonics of the Earth’s Schumann resonance which set’s up her negentropy, and the harmonics of hydrogen which sets up negentropic gravity in water and DNA- and many other examples. It is true of the exact wavelength of the only 2 frequencies that make photosynthesis. It is true of the exact wavelength of ADP – charge collapse to ATP- center of cell metabolism. It is true of the exact frequency of the famous blood pressure MAYER wave – .1 hz- and the key related center points of HRV – (Heart Rate Variability) the LF and VF peaks. It is true of the duration of the Earth Year, Venus Year, Precession AND Galactic Year. These virtually and significantly precise alignments to NEGENTROPY wave mechanics- CANNOT be a ‘coincidence’ and therefore present overwhelming evidence of the correctness of our hypothesis- that this PHASE CONJUGATE NEGENTROPIC/IMPLOSIVE CHARGE COLLAPSE- is the ORIGIN OF NEGENTROPY (generalized origin of order out of chaos). First: understanding the physics. We showed by wave equations – that golden ratio is THE solution to max constructive wave interference (and therefore generalized solution to compression / implosion and phase conjugation) – in the published article www.fractalfield.com/mathematicsoffusion. Therefore it is logical that this infinite constructive wave collapse (Einstein’s words for the definition of gravity) – must converge at a universal threshold point. It is obvious what that point is- namely the Planck length and time (‘sphere’) – which is the universal musical key signature of every wave science has ever measured. (Nassim Haramein and I and many others converge here). The reason constructive interference works- is that phase conjugation (by golden ratio) is well known to be the mechanism to produce LONGITUDINAL EMF ( sometimes erroneously labelled scalar waves). These are well known to be faster than light and penetrate thru about anything ..and anytime- and therefore are undoubtedly the mechanism of gravity waves (see Hodowanec picture- superluminal gravity wave measures www.fractalfield.com/conjugategravity). Since this PHASE CONJUGATE MODEL OF GRAVITY – requires that the faster than light longitudinal EMF which ARE the gravity waves – propagate primarily at GOLDEN RATIO phase conjugate multiples OF the speed of light- it is HIGHLY significant that Prof Raymond Chiao – pioneering measures of faster than light speeds (see below) – have been centered between 1.5 and 1.7 times the speed of light- powerfully pointing to 1.618 (golden ratio)! This means that at the planck sphere a conjugate longitudinal EMF is generated (gravity wave) at a universal key signature. This also then becomes the key signature wave mechanic which regulates ‘DNA radio’ (collective unconscious/ communion of saints), and -we hypothesize – interstellar gravity mechanics. This is consistent with New Scientist magazine cover showed the Universe is Dodeca / golden ratio, while Nature magazine showed the Universe is Fractal; it is because the stellated dodeca/icosa (golden ratio phase conjugate field propagation – model see Star Mother Kit – goldenmean.info/kit) – IS the only possible 3D – FRACTAL FIELD. Important to note below how we proved 3 key radii of hydrogen also fit my new equation- proving the heart of hydrogen, the heart of water, and the center bond of every DNA codon (hydrogen) – is precisely a phase conjugate fractal field radiator. Let us summarize: implosive charge collapse by golden ratio phase conjugation to the planck sphere is here hypothesized to be the generalized origin of all negentropy and self-organization – especially the cause and origin of gravity, water, color, perception/consciousness, and life (all centripetal forces). As you see in the image set (10 golden spiral top down view of hydrogen and DNA etc) – the reason the wave mechanics of golden ratio (phase conjugation) work to create gravity and centripetal forces in general – is that only this compression path allows the wave phase velocities to heterodyne (recursively interfere) non-destructively. Only in this golden ratio harmonic series then can the PHASE VELOCITIES toward center add and multiply constructively (recursion / fractality and inPHIknit compression – perfected in wave mechanics). Thus only this geometry turns COMPRESSION OF CHARGE TOWARD CENTER in to ACCELERATION OF CHARGE TOWARD CENTER. This author is emphatic -(along with Einstein) that ACCELERATION OF CHARGE toward center is the most elegant electrical definition of gravity. This author is not the first to hypothesize fractality is the functional cause of gravity (Andrei Linde, ‘Surfer Dude’ Garrett Lisi’s golden ratio based E8 work etc) but we may be the first to specifically describe the wave mechanics for HOW golden ratio (fractal recursive) phase conjugation electrically causes gravity (only golden ratio constructive recursive phase velocity heteodynes produce charge acceleration toward center directly producing acceleration from compression). 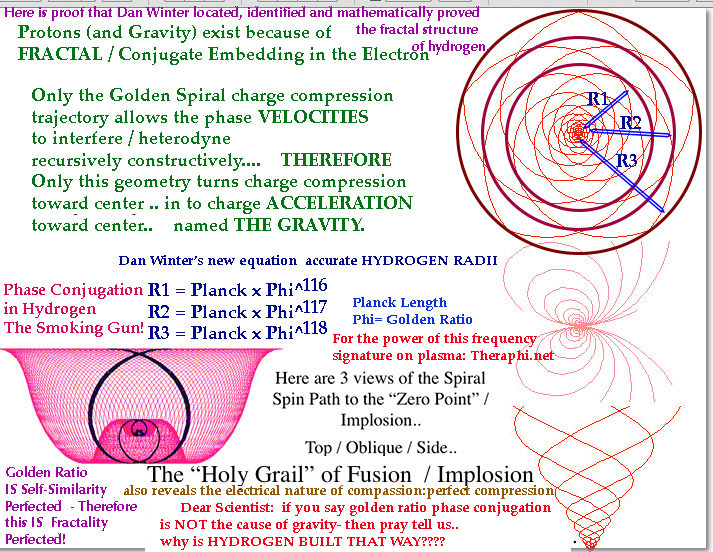 See here our new picture of hydrogen radii to see how this implosive charge collapse works (2nd image below). 3D animation: goldenmean.info/grail, 3D fractal- ‘Star Mother’ kit assembly goldenmean.info/kit.